This popular day-use park features over 600-acres of old growth forest. 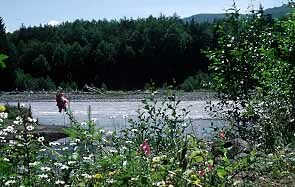 Located along the White River, the park provides visitors with 12 miles of hiking trails, with many short interpretive loops. The Catherine Montgomery Interpretive Center is open in the summer and group tours are available. The park features picnicking, hiking, fishing and cross country skiing in winter. The Washington State Parks system includes more than 125 developed parks and covers about a quarter million acres.